Capcom likely could have never predicted just how big the Gyakuten Saiban series would end up becoming for them, both at home and abroad as its localized Ace Attorney counterpart. Its sixth main entry Spirit of Justice is proof that the franchise has continued to improve itself musically with more sophisticated compositions and upgrades to its sound quality after its primitive GBA origins 15 years ago. Series veteran Noriyuki Iwadare is once again responsible for the proceedings, joined by newcomer Masami Onodera and Capcom regular Toshihiko Horiyama who had previously worked on Gyakuten Saiban 4. As Spirit of Justice features a narrative partially set in the fictional country of Khura’in, the score reflects upon the foreignness with a unique Eastern-tinged soundscape, while familiar themes are given new life with high quality arrangements. With a mix of both old and new, has the series taken the next step forward musically? The opening notes of the two brief introductory tracks “A Quiet Prayer” and “Spirit of Justice ~ Prologue,” while not too impressive on their own, give the listener a hint of what to expect from the sounds of Khura’in. Ambient synths, tribal percussion, distant chanting, and stirring strings are key elements which are explored in later portions of the soundtrack. The first real track is “Khura’inese Towns ~ A Rambling Travel,” a minimalistic area theme carried by a folksy duet between sitar and flute samples. As opposed to previous games in the series, this tone of ambience over melody continues with Noriyuki Iwadare’s courtroom themes. “Defendant Lobby ~ Prelude to the Revolution” hints at the oddities protagonist Phoenix Wright will face performing in a foreign court of law with its fragmented harmonies coming from the various Eastern instruments. This transitions immediately into “Spirit of Justice ~ Court Begins Abroad,” a stark theme that paints the picture of ancient laws upheld by centuries of tradition. The deep percussion is what stood out to me the most, having a booming presence backed by airy flutes and erhu strings. “The Dance of Devotion” opens with brief sitar and then transitions into chanting by Haruka Shimotsuki. Though brief, its high production values and use of actual vocals as opposed to samples makes it a stand-out track. New to Spirit of Justice is the introduction of divination séances, a gameplay mechanic that recalls a victim’s last moments before their death. The accompanying pieces “Divination Séances ~ Last Sights” and “Divination Séances ~ The Spirit’s Accusations” do not have much going for them melody-wise and feel more effective in-game. “Potdino ~ Ethnic Music” and “Potdino ~ Head-Banging,” by Masami Onodera and Toshihiko Horiyama respectively, also feel as if they would be more effective in context. 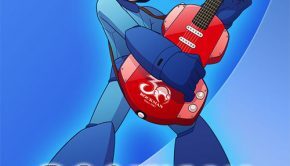 The former appears to utilize the game’s text sound effect paired with sitar, while the latter has the same theme set to a rock variation sounding much like Horiyama’s Mega Man work. “Cross Examination ~ Moderato 2016” and its Allegro variation are closer to what Iwadare has done with the series previously, being more conventional with their instrumentation. There’s nothing too notable here, but the latter version does benefit from strong rhythm and improvisation from the backing elements. Similarly, “Logic Construct” returns to the series roots being an atmospheric bell and synth piece utilized when diagrams and evidence are being analyzed in court. “Phoenix Wright ~ Objection! 2016” is a call to Iwadare’s original theme from Gyakuten Saiban 3 and a fitting arrangement that is brassy with the main melody handed to violin. “Pursuit ~ Coming Together,” while not as strong as previous Pursuit themes in the series, has a memorable melody that benefits from strong synths and with harmonic elements that come together excellently from its various layers of sound. “Confess the Truth 2016,” however, turns out to be even better with its effective organ, bass, and percussion combination which truly drive home the dramatic emotions that Iwadare attempts to convey. “Won the Case! ~ Each of Their Victories” additionally proves to be a memorable theme of upbeat strings and woodwinds that feels almost Baroque-esque. Since Spirit of Justice additionally has cases taking place in the series’ normal setting there are three additional courtroom tracks. “Defendant Lobby ~ Prelude to the Truth” benefits from having high quality string flourishes and pizzicatos that amp up the tension felt by secondary protagonist Apollo Justice. “Spirit of Justice ~ Court Begins” has all of its elements coming together into a track that paradoxically feels relaxing and serious at the same time with its bass backing being a highlight. “The Basics of the Case,” is heavily pizzicato-focused and appropriately ambient. Character themes are an essential part of Ace Attorney’s music and several older ones return with top-notch arrangements. Masakazu Sugimori’s theme for Maya Fey from the first Ace Attorney game is no stranger to arrangements and the one presented here for Spirit of Justice is a great take on woodwinds and bass. The melody from “Ema Skye ~ Scientific Detective 2016” was originally an inverted variation of the same theme, and here it’s presented in a funky synth arrangement that directly feels appropriate for the eccentric nature of the character. Continuing on, “Troup Gramarye 2016” takes one of my favorite themes from Apollo Justice and enhances it with higher quality synth and more prominent acoustics. Another highlight from that game was the main theme for the titular character, included here as “Apollo Justice ~ A New Chapter of Trials! 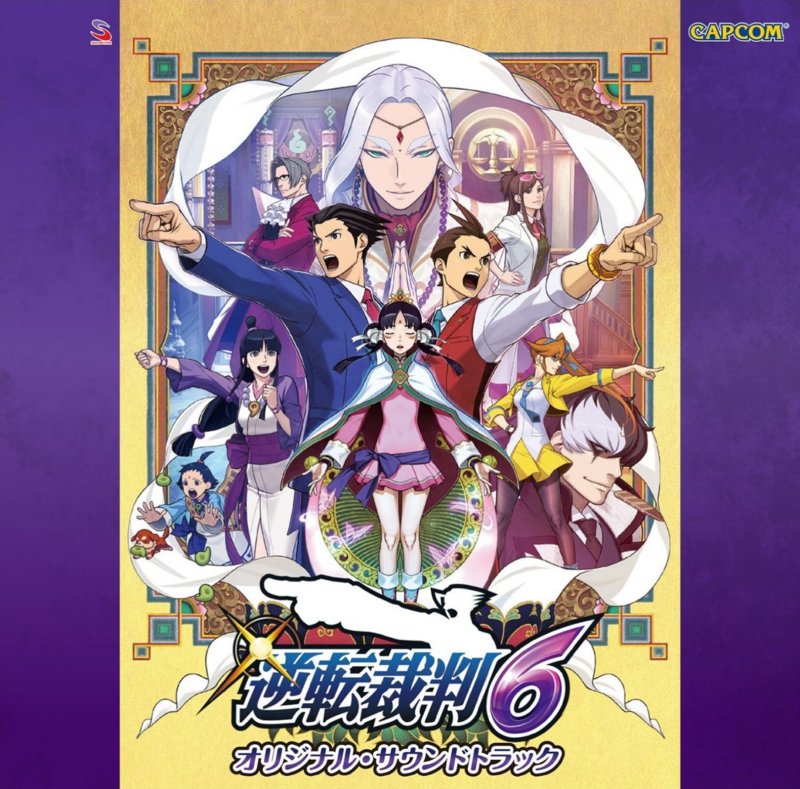 2016.” While I am slightly more partial to the rock arrangement that was part of Gyakuten Saiban 5’s soundtrack, Spirit of Justice’s version is yet another success and features some interesting expanded improvisations. One arrangement I actually like better than the original track is that for Athena Cykes. The electric guitar performance of the melody is remarkable, while the transitions between sections are unpredictable. Not boring for a second, it had my attention the whole way through. A more curious inclusion, however, is “Larry Butz ~ When Something Smells, It’s Usually Me 2016,” a humorous theme composed by Iwadare in Gyakuten Saiban 3 that here receives a much needed synth upgrade from the original GBA track. The only remix that I did not care for is “Spirit Warrior Torisaman,” meant to be a distorted variation of the highly acclaimed Steel Samurai theme from the first game in the series. While perhaps relevant in-game, here it falls flat as a poor imitation of the original. There are an abundance of themes for Spirit of Justice’s new characters. “Nahyuta Sahdmadhi ~ The Last Rites Prosecutor,” in accordance to the mystic nature of the game’s antagonist, is mysterious and haunting. With graceful strings providing a rustic tune, it’s one of Iwadare’s best character tracks on the album and comes as a must-listen. “The Avian Princess ~ Guardian of Khura’in” begins with a loud strike and immediately transitions into a tango-like theme on strings unrelenting in fast tempo. Most of Ace Attorney’s character pieces tend to be mellow or relaxing, but here Iwadare is firing on all cylinders which results in a track that can only be described as breathtaking. Akin to it is Iwadare’s “The Revolutionaries ~ The Dragons of Rebellion,” another fast-paced track, though I preferred the instrumentation of the former. In contrast, “The Holy Mother ~ The Teachings of Khura’in” is reminiscent of traditional Japanese music, complete with shamisen and bells. Iwadare’s other new character theme is “Druk ~ A Dragon Never Yields.” Regal-sounding and formal, it gives off the vibes of heroism and bravery though borders on being slightly generic. Toshihiko Horiyama only contributes three character pieces, all of which call back to his work on Gyakuten Saiban 4. “Mr. Menyou ~ The Masked Magician” utilizes his signature quirky synth style and manages to have far more presence that I would have expected. “Shizuku Ootsube ~ Walking Down the Aisle” is perhaps one of the most calming tracks on the album, being a combination of soothing retro sounds and smooth chamber-like strings. “Cheerful People” is a short piece used for miscellaneous and minor characters, once again being a display of Horiyama’s upbeat tendencies. Masami Onodera’s two character themes both are heavily Japanese inspired though are executed in different ways. “Senpuutei Biifu ~ The Laughing Typhoon” is a light-hearted koto piece that features a catchy melody, while “Kiyoki Masaharu ~ A Vote for Kiyoki!” combines Japanese vocals and percussion with Western elements such as saxophone and horns. Moving on to location themes, from Gyakuten Saiban 2 there is an upgraded remix of “Kurain Village,” here finally performed on traditional Japanese instruments which improves the quality significantly. “Detention Center ~ Cold Glass Elegy” by Horiyama employs chilling piano bars to create feelings of despair, while Onodera’s “Detention Center ~ Iron-Bar Elegy” is subtler with its acoustic anonymousness. “Investigation ~ Opening 2016” and “Investigation ~ Core 2016,” used when the player is searching crime scenes, both are effective in being subtle background to the gameplay and stand on their own as strong tracks when listened to independently. The former takes a laid-back jazzier approach, while the latter is more serious (even somewhat cinematic) reflecting upon the new developments of the investigation. The two additional investigation tracks by Onodera, used for the Khura’inese sections of the game, have similar composition but employ Eastern instrumentation. Spirt of Justice has a large amount of reminiscence tracks, the majority of which are effective for use within in-game flashbacks, but are too similar to one another to draw that many differences. Of them though, “Reminiscing ~ Inherited Hopes” stood out to me the most due to the use of shakuhachi flute and wistful strings. 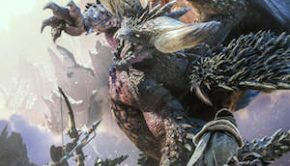 The remaining cutscene and event tracks are also generally well-done, but work better within narrative context instead of on a standalone basis. Wrapping up the score strongly is Iwadare’s ten-minute long ending theme which does everything a good staff roll piece should do. A jazzy arrangement of Apollo’s theme opens the medley, an extended version of “The Dance of Devotion” concludes it, and various cues from throughout the game are encapsulated in between. 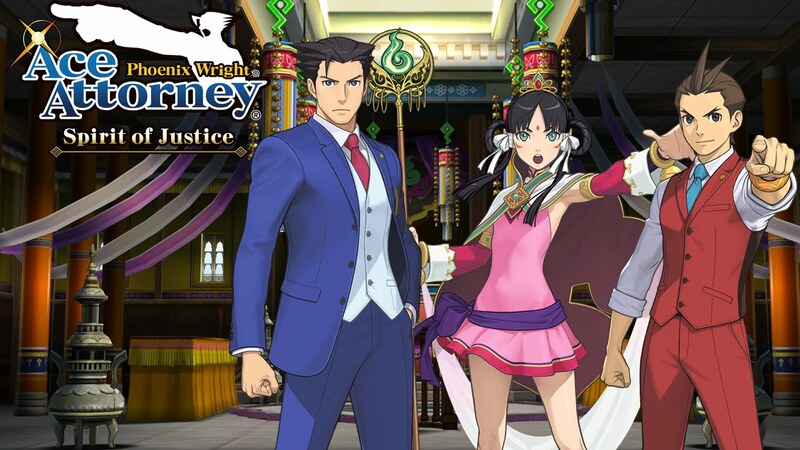 Phoenix Wright: Ace Attorney – Spirit of Justice represents a turning point for the musical progression of the series. Noriyuki Iwadare, Toshihiko Horiyama, and Masami Onodera each contribute a sizable amount of varied tracks that are more melodically complex than the previous games, while the production values are noticeably of higher quality in comparison. 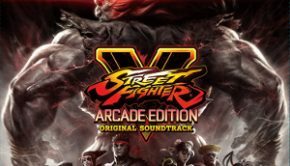 Some tracks work better within the context of the game itself, but the memorable melodies, strong instrumentation, and consistent variety win out in the end. Iwadare and his fellow composers could have created something closer to their previous efforts, but instead chose to take risks that most assuredly paid off. 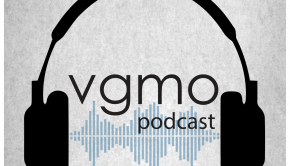 Highly recommended for fans of the series and newer listeners will find plenty to enjoy. Posted on September 2, 2016 by Oliver Jia. Last modified on September 6, 2016.